Samantha Lee, a nanny from Dominica, remembers a time when one of her former employers overstepped her boundaries by trying to drop children off at her home without permission. “When I first came here and I started working as a nanny, she tried to bring kids over and I explained to her, ‘Oh no, am I going to get paid to take care of them?’ And she goes ‘Ohhh no, they are just staying over a little while,’ ” said Lee, who is in her mid-30s and lives in Brooklyn. That lack of respect impressed on Lee the importance for domestic workers to speak up for themselves. Now Lee is an officer in Domestic Workers United, which has organized 500 members — primarily women from the Caribbean, South Asia and Latin America — around the principle that nannies, housekeepers and caregivers for the elderly should know their rights and enforce them. Lewis, also a nanny from Trinidad and who declined to give her age, said that some immigrant domestic workers often get paid next to nothing for their hard work. They receive salaries as low as $5 an hour, making it difficult for them to make a decent living. “When I look at it, you get below minimum wage. People are still getting five-something or $6 an hour,” she said. The New York State minimum wage for 2015 is $8.75 an hour. Lee, Francois, and Lewis are just three of many immigrant nannies from the Caribbean who live and work in New York City. One can easily spot the Carribbean-born nannies wandering the streets with white children in tow during the day–especially in middle- to upper-class communities such as Park Slope. Although these nannies may appear at ease, some of them face injustice on their jobs. Nannies sense that they are looked down upon because their work is considered inferior or for the simple fact that they are immigrants of color. One of the common injustices that immigrant nannies face is racism. A few years ago, it was reported that another domestic worker from Trinidad recalled being forced to read a racist nursery rhyme to the child she cared for even though she felt uncomfortable about it. Francois said that she too experienced racism in a dispute involving an aggressive father on the job. “I was physically assaulted by my ex-employer. You know, I worked for them for six-and-a-half years; I was taking care of this little girl and I don’t know what side he woke up on or what kind of day he had but when he came home he wasn’t a pleasant person to relate to,” she recalled. That evening, he yelled at his child when Francois asked him to stop and he called her “a stupid black [expletive]… he cuff me down in my face… that happened in 2010…” Francois filed a lawsuit, which took three years, but she won the case. Domestic Workers United, according to its official website, was founded in 2000 by a domestic workers organization for Filipina women as well as a domestic workers group for South Asian women. 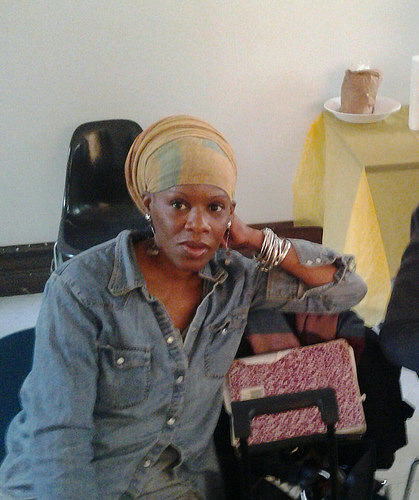 Through these groups’ monthly gatherings in Brooklyn, Caribbean nannies met, which led them to create Domestic Workers United. “DWU is a movement of women, primarily women of color, and a domestic worker is a nanny and a caregiver; someone who cleans the house it is all the genre of domestic work right…even a nanny or a fancy word is governess,” Lewis said. She joined in 2001, after working as a nanny for wealthy families. Francois joined a year after Lewis, saying, “I have been a member since 2002. I found a flyer in Central Park and when I picked up that flyer and read the contents–being an undocumented nanny–I realized this organization is a place where I should be a part of. Since then in 2002, when I went to my first meeting, I never looked back because when I got there I met a lot of different women from different cultures and different races.” Lee, on the other hand, arrived at DWU many years later in 2014. She joined after her mother, who is also a nanny, suggested she become a member. 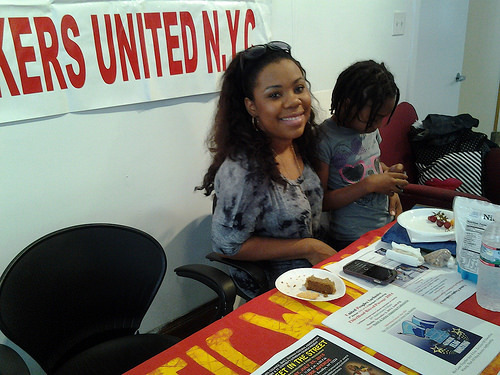 Domestic Workers United serves as a judgment-free zone, a safe haven for immigrant nannies. It is a revolving door, since most of them don’t remain nannies forever. Some go on to pursue higher education or join other fields like nursing or open daycare centers. A quarter of domestic workers make minimum wage, averaging a salary around $17,000 a year. Recent news reports say that one immigrant nanny from the Caribbean made $700 a month and another from South America allegedly made under $3 an hour. A common misconception about immigrant nannies is that they didn’t have careers prior to their domestic work. Lewis was actually a teacher in Trinidad before she arrived in the States. “None of us were domestic workers in our countries, none of us! We went to school and had professions–for me I was a literacy teacher,” she said. “We don’t know domestic work. I felt guilt, but it was a job. Nobody was paying my bill.” However, these women learn to get over these feelings for the sake of getting their jobs done. And sometimes it comes at a high price. Some domestic workers are so drained from taking care of other children that they have to find strength to raise their own children when they get home. Add that to spending money to support both their family in America as well as their family members abroad. To help alleviate this, nannies join forces to help one another. One method is a su su–a group system created to pool money together, a common practice in the West Indian community. The money is then used to assist the nannies with expenses such as American citizenship fees. Another method is one that Domestic Workers United fought for to give immigrant nannies support. “We fought for the bill of rights, to put some teeth in it,” Lewis said, referring to a New York State law that was passed in 2010. The Domestic Workers Bill of Rights is a set of standards for domestic workers. It requires that employers give them disability benefits, overtime pay, rest days, paid vacation, and more. It also provides protection against sexual or racial harassment. This law is especially important for nannies who start as young as 19 years old, and don’t necessarily know the seriousness of what they are getting into. Even so, immigrant nannies have some great experiences. “Not all employers are bad people. I’ve had wonderful experiences working with people,” Lewis said. Lee and Francois agreed, saying that, in many cases, they adore the children they care for. When these children grow older, some of them keep in contact with the nannies to see how they are doing. They even take a piece of the West Indian culture they learned with them, including being familiar with dialects from the region.